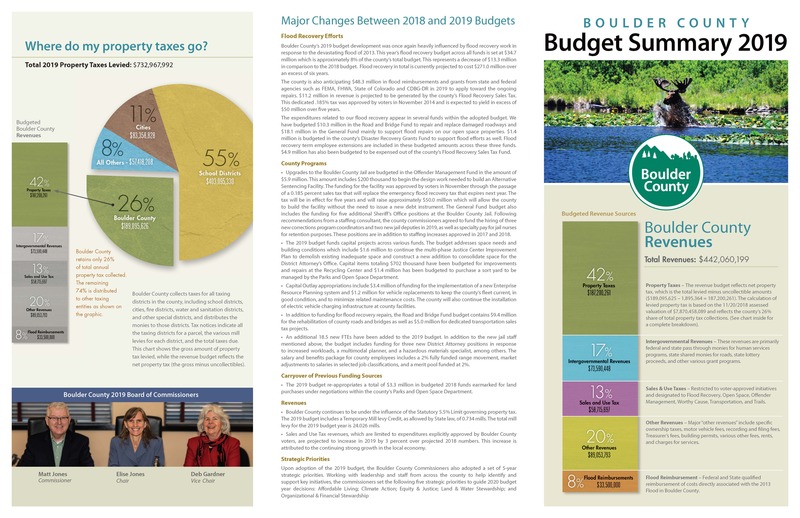 Boulder County government assumes a variety of roles and carries out core responsibilities in order to help foster a vibrant, healthy, and active community. Our annual budget process allows for the careful allocation of tax dollars to help with important county functions such as maintaining our well-traveled roads, conducting law and public safety services, providing housing counseling and nutrition assistance for our youngest and oldest residents, and working together to create visionary open space and land use policies. The Treasurer’s Office collects taxes for all taxing districts in the county, including Boulder County government, school districts, cities, fire districts, water and sanitation districts, and other special districts, and distributes the monies to those districts. The State of Colorado collects sales tax revenue. Interested in learning more about Financial Reporting for Boulder County? Visit our Financial Reporting page.